Looking after your health is not just a matter of looking after your organs and muscles. While these macroscopic structures are crucial to your general health and wellbeing, they themselves are dependent on much tinier, microscopic elements. Microscopic cells make up every structure in the human body and if these aren’t functioning correctly, then neither will any single organ, muscle or structure. If you want to improve your energy, protect against disease and illness or slow down the clock when it comes to ageing; then understanding how your cells work and supporting their function should be your priority. This way you’ll be getting to the very root of your biology, and improving your vitality throughout your entire system. When you see a picture of a cell, it will normally be portrayed as a gooey little blob with a smaller floating somewhere around the middle. This is a fairly accurate picture, but of course there’s a little more going on here. Firstly, that main jelly like fluid is made up of something called cytosol and is actually known as ‘cytoplasm’. This cytoplasm is meanwhile held together partly by a series of long fibres collectively called the ‘cytoskeleton’. This structure determines the shape of the cell, aids cell division (mitosis) and helps transport other compounds within the cell. It’s like the little train at Disneyland. The cell membrane surrounds the whole thing and keeps it from spilling out everywhere (it is also sometimes called the phospholipid bilayer membrane). The cell membrane also contains other little ‘sacks’ called ‘vesicles’. These are sacks of other compounds that can be released or used as necessary – in the brain for instance vesicles will contain neurotransmitters like serotonin or dopamine. 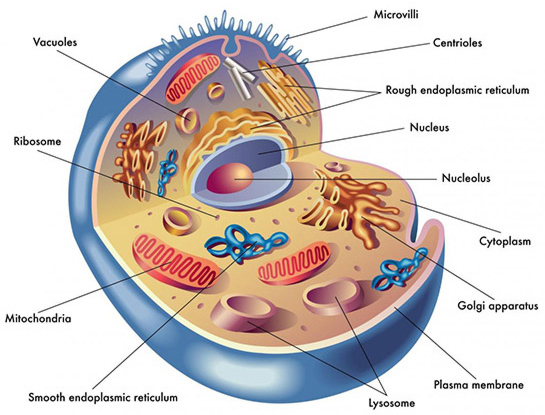 The nucleus is that all important blob in the centre of the cell which contains the chromosomes. Chromosomes are highly important because they hold the DNA – genetic code – that determines how every cell should behave within the body. A ‘nuclear envelope’ surrounds the nucleus and works in a similar fashion to the cell membrane. Floating around the cytoplasm are mitochondria. These are ‘organelles’ that can convert the energy from food into a useable form for the cells. They actually have their own genetic material that’s distinct from the DNA and can replicate in a similar way to the cells at large. These are an area of great interest for athletes and for anyone trying to improve their health and energy. Ribosomes are also organelles like the mitochondria, except they have the different job of creating proteins. They also float freely within the cytoplasm. Organelles are not considered ‘alive’ in their own right due to their lack of cells, however in many senses they could be considered ‘almost alive’ as they can assimilate, grow, move, reproduce and even excrete. Were you to zoom in on your cell, it would look almost like an aquarium! Specifically ribosomes work by using ‘RNA’ as a ‘chemical messenger’ from the DNA, which instructs them how to rebuild amino acids (which come from protein in our food) into the new proteins we need in our body. Now you have a little bit of an idea of how your cells are structured, you can start thinking about how to improve their health in order to prevent disease and improve performance. For instance, it’s worth considering that the cytoplasm is made mostly of water. This is the ‘stuff of cells’, and thus the entire cell is actually made of around 70% water. That’s why we are made of 70% water, and it’s why it’s so important that we drink plenty throughout the day in order to be healthy and operate optimally. Another way to improve cell health is to eat omega 3 fatty acid. This is because fats are used to form cell membranes, and omega 3’s structure provides a highly flexible form of fat that allows for other compounds to be transferred more easily in and out of the cells. In short, omega 3 can improve cell fluidity. Cells are also made of proteins and amino acids in varying quantities and ratios depending on the role of the cells. It is thus highly important to ensure that we get enough amino acids via proteins in our diet to ensure strong and healthy cells. The cell membrane is also very important for cell health because it helps to protect the cell and thus the all-important nucleus from assaults from outside. Oxygen is highly important for our body to perform all of its normal functions, but while our body is highly efficient at using oxygen, in about 1-2% of cases free radicals will be created as an unwanted by-product. These are atoms or groups of atoms with unpaired electrons, making them highly reactive. These free radicals then try to steel electrons in order to become stable, and can thus damage other important molecules such as DNA, RNA, cell membranes, proteins etc. in the process. Once those molecules becomes damaged, they can then act as free radicals themselves leading to a cascading effect. Free radicals can also come from other places (such as molecules being damaged by heat or smoke), but oxygen is one of the most common causes. The reactiveness of oxygen is what makes it useful, but it is also what makes it damaging. Fortunately antioxidants in our diet can neutralise these free radicals, so that they are eliminated when they come into contact. There are many great antioxidants in our diet, which include things like vitamin C, vitamin E and flavonoids. Getting these in your diet is one of the best ways to improve cell health. It also follows of course that you can avoid damage from free radicals by preventing them from occurring in the first place. This can be achieved by avoiding cigarette smoke, sunburn and other toxins that wage war on the surface of our cells and can potentially lead to serious problems if they reach the DNA. We can also improve the function of our cells by helping them to create and use energy. Supplementing with creatine for instance can help our body to make more use of ATP by recycling used ATP (ADP) back into a useable form – though this is likely of more interest to performance athletes. L-carnitine meanwhile may help energy levels for athletes and regular folk by helping to transport fatty triglycerides to the mitochondria to be burned as fuel. With a healthy diet and lifestyle, as well as some targeted supplementation then, it is possible to protect the cells and ensure that they perform optimally. As a result, you’ll see a cascading effect throughout your entire body that ultimately results in more energy, better health and fewer illnesses. Are Frozen Vegetables Really Just as Good for You?